Doctor Who: THE TENTH DOCTOR #2.14 Review @comicstitan | Warped Factor - Words in the Key of Geek. Tony goes off the map. Let’s make no bones about something. 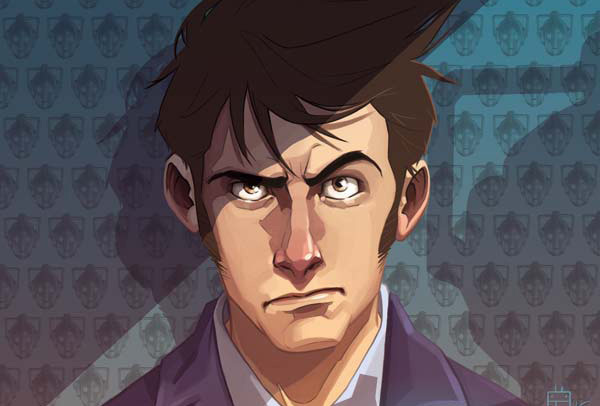 The Tenth Doctor #2.14 is technically a bit of a filler episode. But it’s filler with attitude, and punch, and sure, it takes the story forward, albeit not necessarily the story we were hoping it would. Issue #2.13 ended on an ‘Oh my God!’ drop-your-teacup cliff-hanger that you’ve sort of been waiting for for quite some time now – since you first saw enormous black Tobleroney triangles in the sky above New York, in fact, and certainly since you realised that Anubis, he of the canine head and the dodgy lineage, was a major player in the second year of Tenth Doctor comic-book stories. After finally getting a cliff-hanger like that, everything in you screams to know what the hell happens next. In an example of classic ‘Make ’em wait for it’ teasing tactics though, this issue for the most part takes us away from Dogface and his existential crisis, leaving us with the Tenth Doctor and Cindy Wu heading to the way, way, freakin’ way distant past to find some things they need to help out the dog-faced boy with his plans to ascend to join the rest of his clan (bar one, of course). 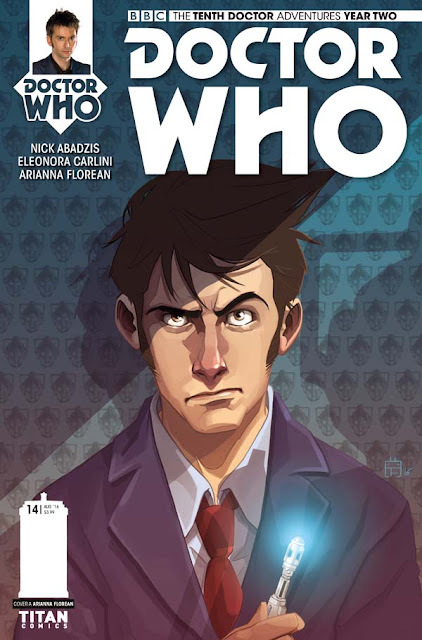 En route, the Tardis team have gone off the map, and in this issue, they find themselves in a version of somewhere familiar that ties in to recent events with the Witch in the Well. It’s a story of savagery and murder by some of the eventually most enlightened people in the history of space-time. This is a little…erm…before they got enlightened, shall we say, and the Doctor and Cindy deal with a potentially shrinking Tardis and unalive sentinels of temporal reality, throwing people to a nasty, painful, death, for reasons of purity and time-sensitivity. Not good news if you happen to be a Time Lord, clearly. But while their adventure in this place of savagery is interesting and well-paced and exciting because it taps into the Witch In The Well storyline and answers some of the questions that left us with, it can’t really do an enormous amount to disguise the fact that it’s writer Nick Abadzis peddling hard to misdirect us with a hearty ‘Look what’s going on over here!’ while our principal interest is over there with Dogface and Dorothy Bell and Gabby Gonzalez. We do return to them at the end of this issue, and it’s they who deliver the cliff-hanger. As cliff-hangers go, it’s a bit of a belter, even if the emotional journey of it is pretty much the same as that of issue #2.13. Certainly in terms of ‘guest appearances’ though, it delivers, making a certain inescapable sense of the construction of the issue – it’s the bit we really want, the bit we’ve been waiting for since at least the end of #2.13, so naturally, Abadzis makes us wait almost the whole issue for it, and uses is as the cliff-hanger to pull us forward and make sure we buy #2.15. We appreciate this on an intellectual level of course, while our Inner Eight Year-Old seethes on the brink of a tantrum, threatening to burst into tears of exasperation, fling itself on the floor and scream ‘WANT MORE DOGFACE!! !’ in the middle of the supermarket. Georgia Sposito on artwork is on great form in this issue though, allowing us to show our Inner Eight Year-Old all the pretty pictures and go ‘Ooh, look! Pretties!’ There’s a crispness to her work that suits the demands of this story arc, and this kind of interesting diversion issue in particular. There’s some peculiarly effective work on the villains in this issue, with a fairly simple body-structure, but heads that do…interesting things, and the backgrounds are frequently stunning – allied to her crisp representation of action, Sposito has a good line in hazy dotwork for backgrounds to dialogue-scenes that gives something of a broader scope to the visual worlds she creates than would otherwise be the case. Arianna Florean and Adele Matera, waving the colourwork wand here, match Sposito mood for mood, giving a sense of speed and pace to escapes from danger, and a sense of languid, creeping peril to the planet-bound sequences of potential death. It all makes for a comic-book that feels involving and intriguing and real, for all it’s a diversion from what we desperately, actually want to know. Grab yourself #2.14 today, for the pretty pictures and the effort that’s put into the diversion, plus a cliff-hanger that will make you whoop quite a bit.